Known globally for its ability to deliver financial solutions to private, institutional and corporate clients across the globe, the Swiss-based UBS Group operates in more than 50 countries worldwide, employing a 65,000-strong workforce. The group comprises the Corporate Center and four business divisions: Wealth Management and Swiss Bank, Wealth Management Americas, Global Asset Management and the Investment Bank. Heading the wealth management division is chief executive officer Jürg Zeltner. 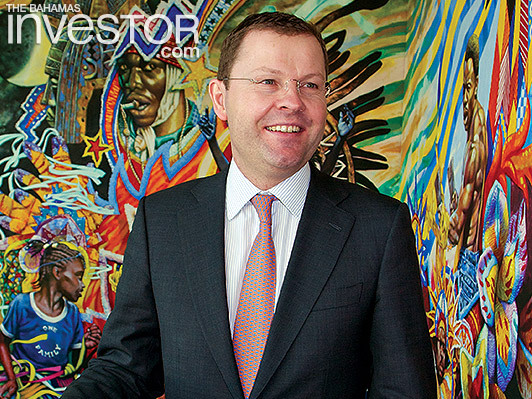 From 2005 to 2007, Zeltner served as CEO of UBS Deutschland, Frankfurt. In November 2007, he was appointed head of wealth management for north, east and central Europe. Two years later, Zeltner became a member of the GroupExecutive Board and co-CEO of Wealth Management and Swiss Bank. Since 2009, he has served as CEO of UBS wealth management. In March, Zeltner visited The Bahamas as a follow-up to his 2011 trip, which familiarized him with local operations. On both trips the CEO met with policy makers, key persons in the financial services sector and the local UBS team. UBS established its presence in Nassau more than 40 years ago and employs 156 persons. In a 2011 Euromoney survey, UBS’s Bahamian operations ranked top in the Investment Products and Trust Services categories. taken to not only grow its market share, but also to deliver added value to clients during uncertain times. Q: What is UBS’s strategy for growth at the global and the regional level? A: As a firm we have re-shaped our strategy recently. In wealth management, we have global aspirations. Geographically our investment focus is in Asia and emerging markets around the world. We’re the dominant bank in wealth management in Europe, as well as in Switzerland. If you want to be the leading global wealth manager, you also need a global investment bank. 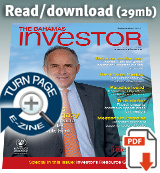 It is important, because our clients expect to have access to the capital market. They want to be serviced across the entire investment spectrum. Geographically, we are present in the markets we want to be in. However, we need to further gain market share. We want to grow one-and-a-half times to two times faster than the markets grow in any given region. This strategy is comfortably underway. We are posting strong growth numbers in Asia. We’ve posted strong growth numbers in all of the emerging markets. In terms of the business segments we cover, it is the high-net-worth and ultra-high-net-worth business. That segment grows faster than gross domestic product (GDP) and that should give us an attractive access to growth, both globally and locally. There is also a trend in the industry that our clients want to be serviced more onshore than offshore, so there is a whole transformation ongoing. We are also transforming into an investment manager. More than a private bank that merely protects its clients’ privacy, we want to be recognized, seen and differentiate ourselves through investment management content. Firstly, we want to reach out to Latin America, using The Bahamas as an attractive booking centre. Secondly, we want to service millionaires and billionaires in a holistic way. We want to use all of the investment spectrum and give them access to growth opportunities and differentiation in the market. Q: In terms of wealth management, what does The Bahamas bring to the table that puts it ahead of its competitors? A: The Bahamas is an attractive, international financial centre. It is also an attractive booking centre, especially in terms of wealth structuring– in particular the trust business. For Latin America, it has the beauty that it is offshore, while still being relatively close by. The Bahamas also has attractive investment law, attractive wealth planning services, is geographically well positioned, and a relatively stable environment. Q: What is UBS’s main strategy, particularly for wealth management when it comes to The Bahamas? A: We want to grow; that’s the first message. Second, we have repositioned in The Bahamas to be globally compliant. The leading countries represented in the OECD [Organisation for Economic Co-operation and Development] basically have made it very clear that a financial centre needs to become transparent. We offer our clients opportunities to comply in a new regime. The world has agreed to a new, level playing field which The Bahamas is part of. That makes it stronger, because it complies and, if it had not, then I think there would not be too much of a future. Q: What are the trends in wealth management right now? What are clients seeking? A: In any conversation with clients it is wealth preservation. People are still shaken up by what has happened. People have lots of questions about the sustainability of the US recovery. People have questions about the restructuring in Europe, what it really means and how big of a problem it is. People want to understand Asia’s dependency on China and whether it’s going to be a soft or a hard landing. Relatively speaking, you still have volatility in the markets. Markets have been surprisingly good to date, but people used that to take profits. Thinking more broadly about the markets, I am actually slightly concerned and cautious about it. Fundamentally the problems are solved: we are no longer in crisis mode in the US; Europe is now printing money, which buys time and takes the stress out of the system. But never forget, what we need is economic prosperity. We need job creation. We need economic growth beyond inflation. To me it looks like there is a paradigm shift from the more developed markets to the more emerging markets. It’s a seismic shift. Q: How has client thinking changed since the economic crisis? A: Everybody got hurt real hard in the financial crisis. Pre-crisis, you were leveraged better. The system was producing good numbers. It was using cheap money to create virtual growth and then it was a deleveraging process and we were confronted with the reality that we have indebted ourselves way beyond what is healthy. So, I don’t think we will go back to the pre-crisis mode. I think we have to settle for a new norm. The new norm will mean gradual recovery. It will be with us for quite some time and that is a game changer in the minds of our clients. Q: What impact has that had on UBS’s strategy? A: The key questions for us are: How can we help our clients preserve their wealth across the cycles? How can we get them access to growth? How can we help them benefit from the fact that in some economies there is growth? How can we help them diversify their risks? That is a fundamental shift away from selling only privacy. We bring all the global knowledge we have, all the access to all the capital markets together in a way that is understandable for our clients. That is extremely important. Today, it is information overflow. People watch what happens in the markets all the time. We help them navigate. For that we apply an advisory model where every client has a personal advisor who is fed information from our research and market assessments with executable ideas. Executable ideas is a key differentiator. Q: What would you say are the qualities that a client advisor needs to have in this present climate? A: There are two fundamental things that a client advisor needs to have: he needs to have a passion for people and he needs to have a love for markets. He needs to be market savvy and have the social competence to be trusted. It’s all about trust. As a client advisor, I need to understand your risk return expectations. It is about the dialogue and this is extremely demanding. The barriers are increasing, because the world is more complex, more cyclical, more volatile. Client advisors have information ready at their fingertips, tailor-made, ready to be delivered to the client. This is an extremely demanding role. Q: When you became CEO of the wealth management unit in 2009, what goals did you set for yourself and how close are you to obtaining them? A: It’s an important phase now to prove to the market we can sustainably grow. When I took office, we had $130-billion outflows. We had the US litigation case open. We had a massive drop in gross margin. We had shrinking profits. We lost many people. The crisis hit us hard. But, that has turned around. We’ve shown $43 billion of net new money last year. We have shown top-line growth. We have geographically expanded. We are hiring good people. We are attractive again. Our client base is growing. Now, the real issue is, make it sustainable, so that we can prove that we benefit from our global reach. Q: Any other goals you want to achieve in your tenure? A: I want us to be recognized as an investment management house, which we clearly are not yet. We are still seen as a wealth manager; a private bank. I want us to be seen as an investment management firm. I want us to be seen as globally successful. I want us to be seen clearly differentiated in the market, and that we are clear in whom we service: ultra-high and high-net-worth individuals.